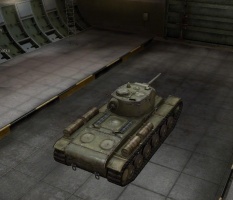 The KV-1S is a Soviet tier 5 heavy tank. Being the only way to access the IS from the heavy line since the 0.7.3 patch, then replaced in 0.9.3 by the KV-85, this tank has become a more common sight in battles. It is the antithesis to its counterpart, the KV-1, as this tank trades in its armor for excellent mobility. This tank can lead an assault and it can either be immediately behind the heavier tanks or try to flank the enemy and hit hard with the 122mm howitzer, or penetrate them to death with your high rate of fire . Despite only having 75mm of frontal armor, the KV-1S is a hard nut to crack, keep in mind though that most shots planted behind the turret will result in a fire. A fire extinguisher is highly recommended for this tank, as well as a medkit. 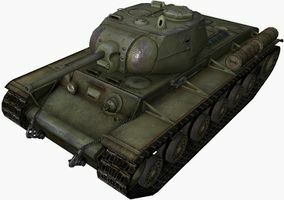 The KV-85 took place of the KV-1S at tier 6 in 0.9.3. The KV-1S leads to the KV-85. 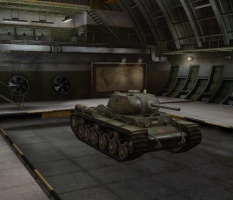 This tank can be quite tricky to play for those who come straight from the KV-1 as it uses a completely different play style from its predecessor. It makes a great front line tank, as its speed and maneuverability allow it to move to where its powerful gun is most needed. If you support a medium flank, you can use the mediums as a distraction to take on the targets they cannot reliably defeat, or give them the added fire power they need to break through. Learn what you can out maneuver, and what you can engage head on. When in the right hands, this tank easily makes up for its shortcomings and offers invaluable practice in learning to drive and operate the IS tank series. Be aware, however, that this tank is not meant to fight at long range. Its long aim time, bad accuracy, and long reload will have you pulling hair out if you try to take on German tanks at range. However, don't be afraid to scope in and shoot if you have a clear, safe shot. Overall, stick to your strength - close range, urban combat fighting and you will come out victorious. But if you see a full HP tier 4 in the sights, don't be afraid to show them one big reason why that is often considered the worst tier in the game. Only the radio transfers over from the KV-1, so equip it first. Tracks should be next, as it allows you to put on all of the equipment. Engine should be next, allowing you to get enough horsepower to make the most of the vehicle. 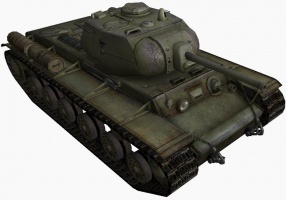 According to one of the KV-1's designers: "During 1942 we were still in need of a reliable heavy tank. That's why we were defeated in Crimea and at Kharkov. The KV-1 completely discredited the concept of a heavy tank". Some Red Army high commanders demanded that all production of heavy tanks be stopped. Others suggested development of an "universal tank", something between heavy and medium tank. By the way, in the 1960's-1970's tank designers around the world came to the conclusion that it was the right decision. Soviet tank builders tried to develop such a tank. This tank was named the KV-13. It contained many brilliant ideas (some of those ideas were applied in the IS-2 tank), however it never served in the Red Army. 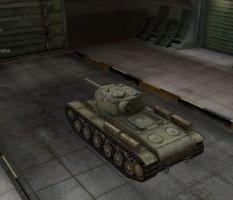 At this time, a new decision was made to fully re-design KV-1. 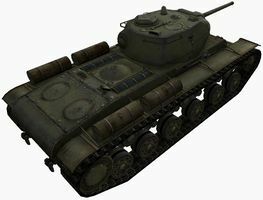 Soviet tank designers wanted to develop a new KV with lighter armor and higher speed and maneuverability like T-34 Medium Tank. 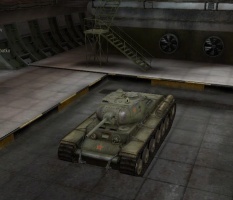 The new tank was named KV-1S where "s" letter means "skorostnoy" or "speed". 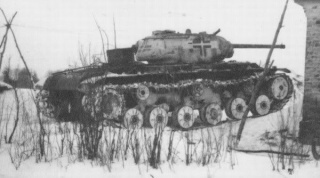 The KV-1S was lighter than its predecessor by up to 5 tons. The thickness of the frontal armor was lowered from 90 mm to 75 mm. The rear hull was re-designed. The existing road wheels were replaced with newer, lighter ones. 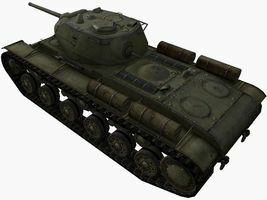 The KV-1's transmission was re-designed as well. The old gear-box was replaced with a new one and the tank received a new turret with a commander's cupola (the first Soviet tank with a commander's cupola was T-50 Light Tank). Both ZIS-5 or F-34 tank guns could be mounted in this turret. In addition, the new tank was armed with four machine-guns: a coaxial MG, a bow MG, an AA machine-gun, and a MG in the rear of the turret. Also, new tracks (608 mm width) were designed specially for this tank. 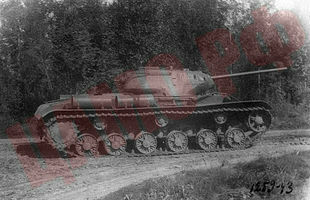 In the summer of 1942, the KV-1S prototype was tested. On August 20, 1942, the production of this tank had begun. However, when the KV-1S appeared in the war theatre, the Red Army was already in need of a tank with thicker armor and better protection. A total of 1370 KV-1S were built. In April 1942 its production was cancelled. Many tanks were sent in tank brigades because the reorganization of the Red Army had not begun yet. 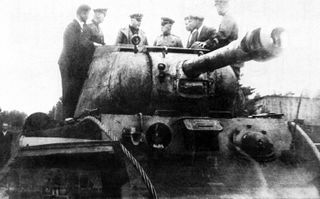 The KV-1S took part in all major operations of the Red Army including Siege of Berlin. This page was last modified on 13 February 2019, at 15:26. This page has been accessed 615,276 times.